The Polar Express, the classic children's book and movie, tells the story of a young boy's struggle to solve the mystery of Santa Claus while aboard a very special train called the Polar Express. 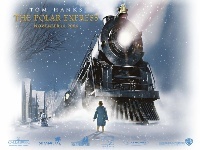 Now, you can own the Polar Express train featured products, books, gifts and other memorabilia. All Aboard!